Common Names: Dogwood Canada, Four-time Mullets, Dwarf cornel, Bunch-berry. Cornus canadensis (L.) known as the four-time or Canadian dogwood is an herb that is found mostly in the undergrowth of the boreal forest of Quebec. An herb is a plant which by definition does not produce cellulose or lignin in the stem and roots. These compounds are particularly wood fiber and impart rigidity and strength to the stems / branches / roots of trees and shrubs. The stems of herbaceous plants are more like grass, stems that are more flexible and malleable than those called Woody. Cornus canadensis for his stem is woody at the base only contrary to common herbaceous plants. 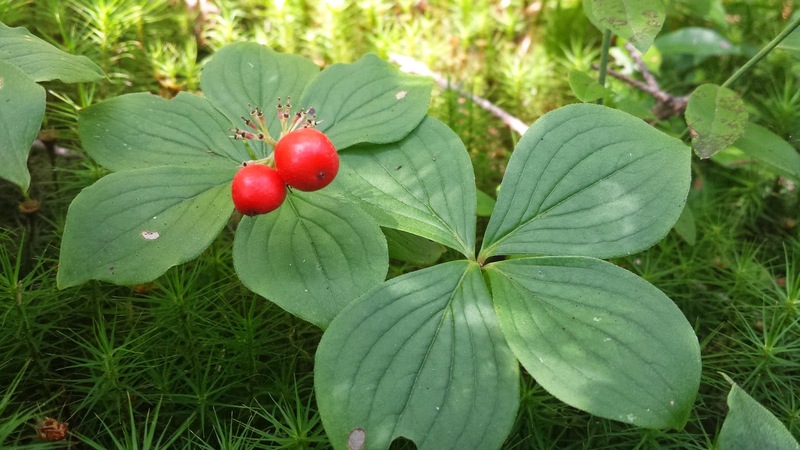 The other species of Cornus in Quebec (C. rugosa, C. obliqua, C. stolnifera and C. alternifolia ) are mostly trees and shrubs except C. suecica is a herbaceous as C. canadensis1. Figure 1 : Cornus canadensis. You can easily recognize the four-time by its small greenish-white flowers, often heavily ribbed oval and the number of four to six leaves and its red globular fruits1 (Figure 1). The literature mentions several times that the fruit is edible dogwood, but without elaborating more on the taste and culinary uses. As against, wherein the core is so hard as unsightly identified as a limitation to its use. Very little literature addresses the accepted four-time biological activities. An article published in the Canadian Journal of Plant Science states that the leaf extract of C. canadensis demonstrate antibacterial activity at low to moderate2. This activity has been measured by various methods (by diffusion (diffusion-plate Hole) by the minimum inhibitory concentration (MIC) and the minimum bactericidal concentration (MBC)) as well as several types of bacteria (Escherichia coli, Aeromonas caviae, Paenibacillus alvei, Micrococcus luteus, Mycobacterium avium subsp. avium and Bacillus cereus)2. (2) Haider M. Hassan, Zi-Hua Jiang, Christina Asmussen, Emma McDonald, W. Q. Antibacterial Activity of Northern Ontario Medicinal Plant Extracts. Canadian Journal of Plant Science 2014, 94, 417–424.